16-in. x 8-in. 16 1/4-in. x 8 1/4-in. The flood door contains a 2” insulated core that has an R-value of 8.34. There is also a felt weather stripping that lines the entire vent frame helping to keep the enclosure as insulated as possible. The Smart Vent product line is constructed out of Marine Grade Stainless Steel and is 100% made in the United States. T316L Stainless Steel is renowned for its ability to withstand usage in harsh marine and chemical environments, ensuring that our products will handle everything Mother Nature throws at them. Because T316L Stainless Steel is known for its strength and resistance to cracking, dents, and embrittlement it’s utilized in high profile projects meant to last decades. Alloyed with Chrome, Nickel, and Molybdenum, T316L Stainless Steel takes the strength of steel and adds protection making it the ultimate flood resistant material. The NEW Flood Vent Sealing Kit (Model #1540-526) works to create a tight seal behind the vent opening and finish off the interior space while the vent is not in use. When a flood event occurs, the pre-cut Homasote® material blows out from the area in the center, creating a now unobstructed opening to allow the insulated flood door to open automatically. Because the Homasote® is composed of 98% recycled material, it is biodegradable and will decompose leading to less post-flood cleanup. 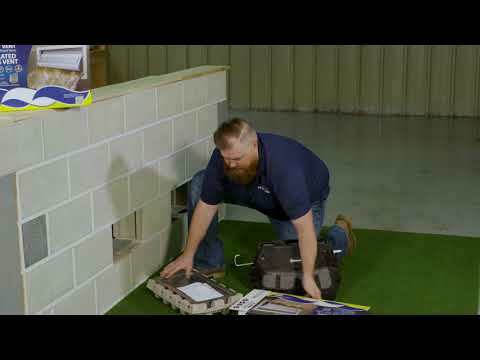 This simple, energy efficient upgrade is for any new or existing SMART VENT Insulated Model #1540-520 in your home or business, which exceeds the 2018 energy codes. View Flood Vent Sealing Kit for more product information.